Bright, breezy and surrounded by nature, the Cedar Lane House is a place of peaceful respite on the southern coast of Australia. 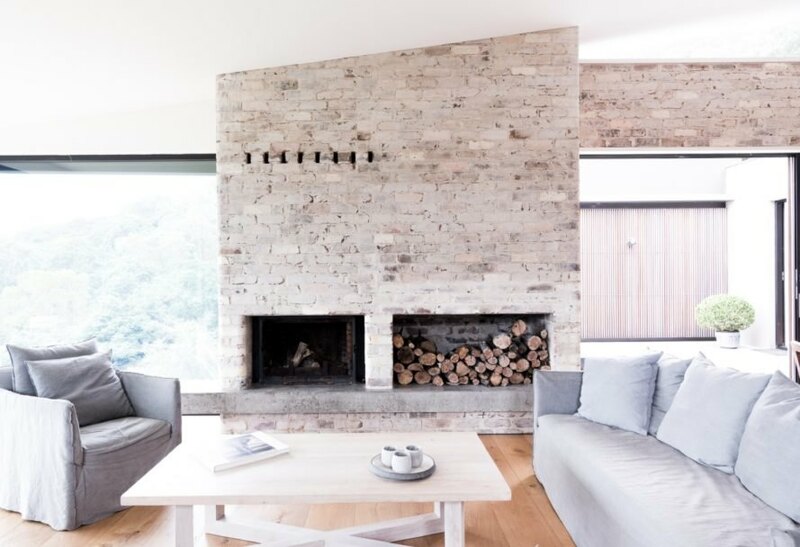 Sydney-based architect and photographer Edward Birch designed the light-filled residence at the base of a mountain in Meroo Meadow. Spread out across 280 square meters, the linear home is anchored by a recycled brick wall that runs the length of the building and imbues the interior with warmth and softness. The Cedar Lane House is organized into three pavilion-like spaces linked by a central east-west hallway. While indoor-outdoor living is celebrated with ample glazing and a natural materials palette, the views are deliberately obscured from the entrance to create an element of surprise when visitors turn the corner and see spectacular landscape vistas through the living room’s walls of glass. 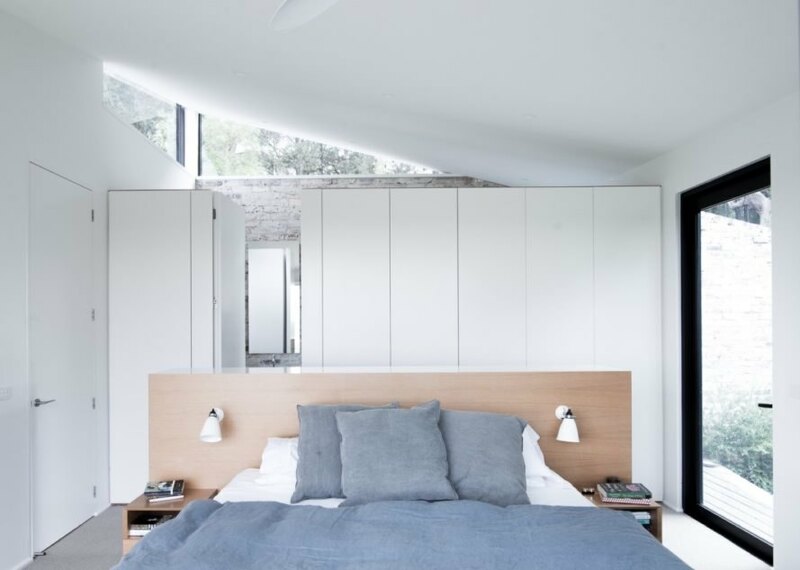 In addition to the whitewashed recycled brick wall, the home interiors are dressed in Australian hardwood, white surfaces and other minimalist materials to keep the focus on the outdoors. 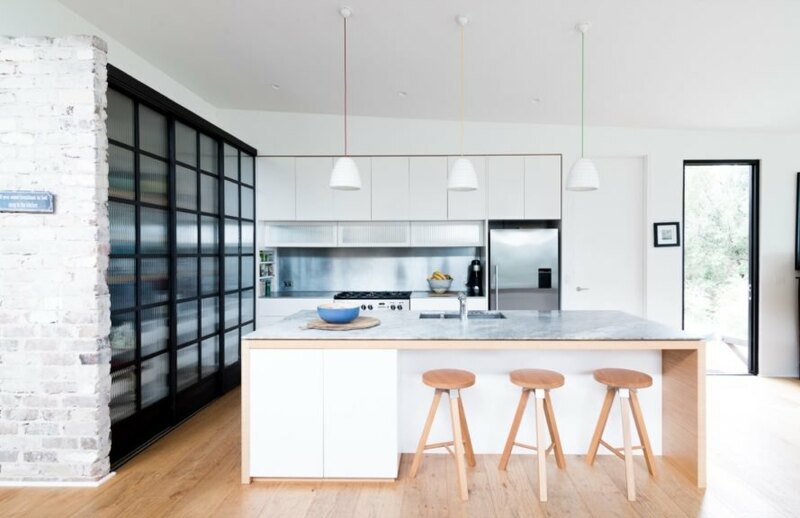 The open-plan living spaces — including a living room, dining area and kitchen — occupy the heart of the home and branch off to an outdoor terrace and an indoor lounge on either side. The easternmost side of the home is defined by a master en suite with an outdoor shower and a spa. Three additional bedrooms, a rumpus room and an outdoor courtyard are located on the west side. The arrangement of spaces makes it easy for the homeowner to close off portions of the house depending on the number of people staying. Instead of main water connections, the house relies on recycled rainwater, which is collected in underground tanks and re-circulated around the building. 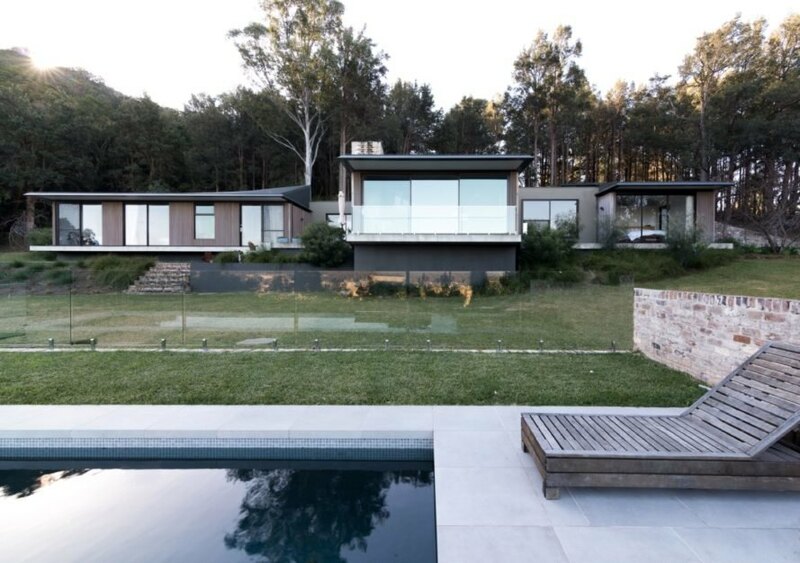 Edward Birch designed this serene home in Meroo Meadow. The home sits peacefully at the base of a mountain. A recycled brick wall runs the length of the home. 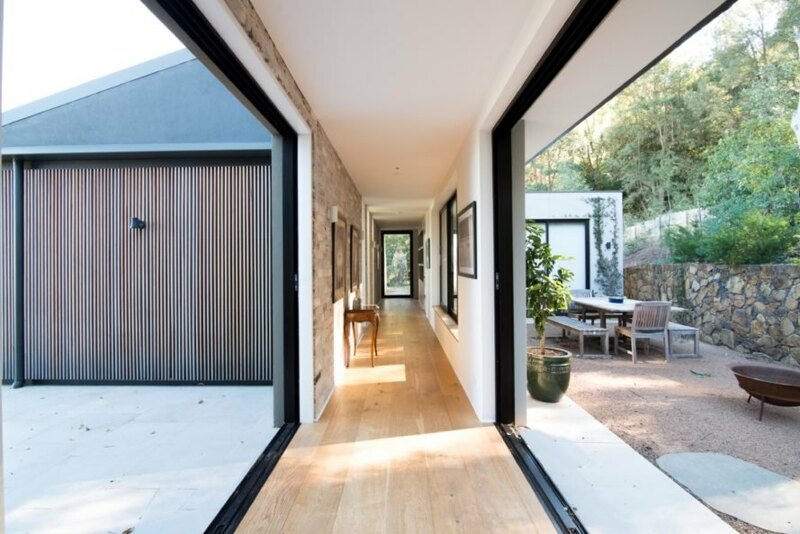 The architect ensured each area of the home was connected to the outdoors. A natural materials palette brightens the space and ties it to the landscape. Each part of the home offers respite. The home overlooks stunning views. 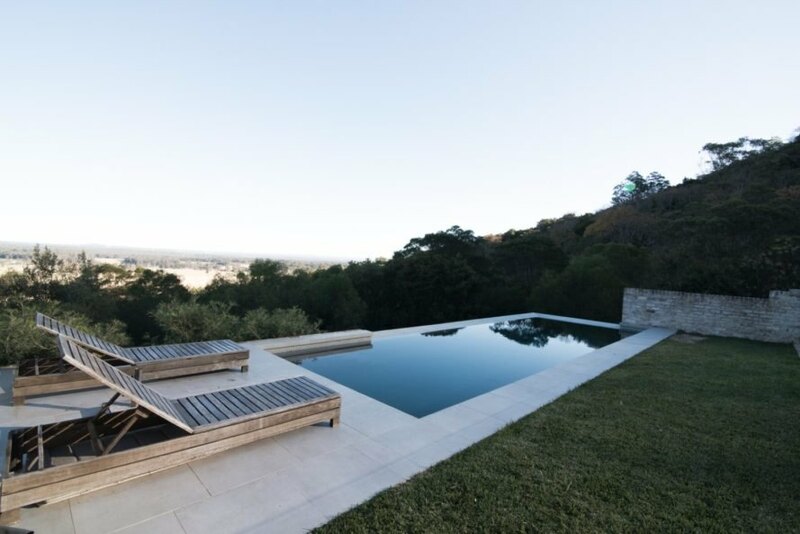 An outdoor pool offers additional space to relax.